I don’t remember what exactly brought me to AGoodRun.com, but I do know that reading (and now actively contributing to) the blog triggered a mix of reactions for me – inspiration to continue partnering my love of running with making a difference, excitement to showcase the area that I now call home, and curiosity about who I would want to thank along my run. Because honestly, how many of us are actually thankful while running for things other than good weather conditions…for remembering to charge your Garmin with enough battery…for not having the urge to use the bathroom until after you’ve finished your run…for being able to make it through the run without hitting every single red light…or “THANK GOODNESS, THAT RUN IS OVER.” etc. No shame. It happens. 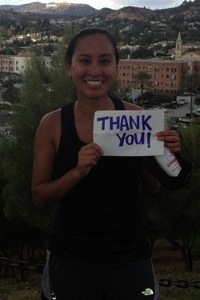 But before I get into my run, I wanted to thank Steve for the simple reminder to take a break from auto-pilot mode and say thank you to somebody. 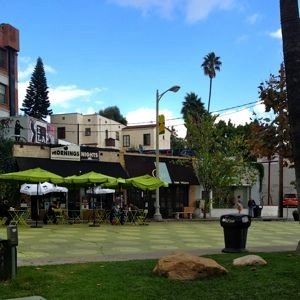 My route takes you through the neighborhoods of Los Feliz and Silverlake, covering points that aren’t usually frequented by the average visitor to Los Angeles. 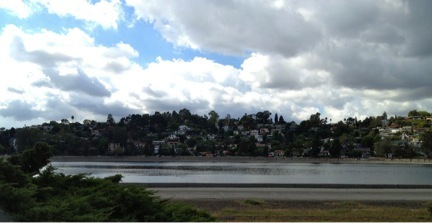 The first stretch takes you out to and around Silverlake Reservoir, specifically with a stop out at the Meadow. The reservoir loop itself is a great alternative to a track, offering plenty of walker and runner space and mixing it up with both flat and inclined areas. You can find a dog park towards the south end, alongside the rec center and occasionally a food truck or two. Year-round, you can find people at the Meadow whether it be for picnics, yoga, kite-flying or lawn bowling. 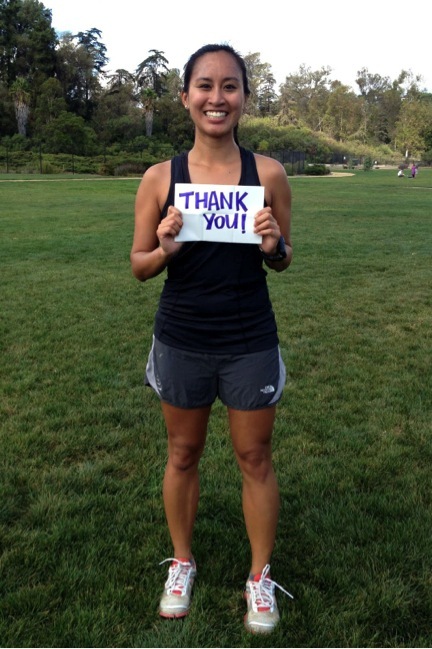 My first thank you goes to Coach A and Coach K, my first running coaches ever. I was sixteen when I signed up to join the cross country team – looking for a sport to keep me in shape until lacrosse season and not really understanding just how much running I had signed myself up for. Ten years and who knows how many pairs of shoes and spikes later, I am still running and definitely attribute how I’ve gotten to where I am today to my learning, captaining and competing in those early years. At this point (as much as I love my mimosas and BBQs), I needed to get continue on my run and headed back across the LA River and into Los Feliz via its namesake boulevard. 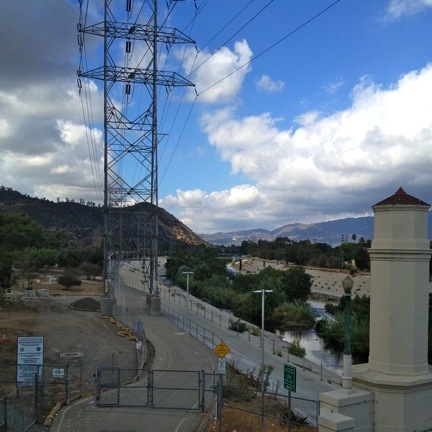 Once you cross over the river and the highway, you happen upon one of the main entrances to Griffith Park. Whether you prefer to adventure by cycling, running, hiking or even horse – the options in the park are plenty. 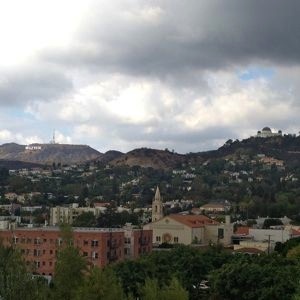 It’s also home to the LA Zoo, the Greek Theatre, the Griffith Observatory and the Autry Museum. Thanks at this stop is dedicated to The Leukemia and Lymphoma Society’s Team in Training (TNT). 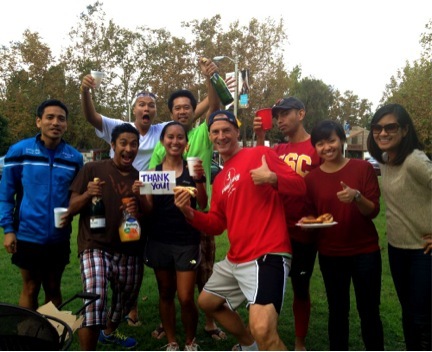 I completed my first marathon with the Greater LA – San Gabriel Valley team this past June at San Diego Rock N Roll, and one of my most memorable practices of the season was the All-Team run practice held at the park. Words really cannot describe how much support and motivation that the participant experience imparts to you over the course of a season, and I am extremely excited to be given the opportunity to mentor as part of the Spring season support staff. After that, I will be signing on as a tri-team participant to complete my first triathlon in September 2013. Thank you, LLS and TNT…and to all the people I’ve met so far (and will meet) through the team, for letting me partner my passion for running to help with the relentless fight to beat cancer! GO TEAM!! The next two miles are mostly residential as we approach the two main streets of Los Feliz Village, Hillhurst and Vermont Aves. Sidewalk traffic tends to get more heavy as you cross over Franklin and enter the tree-lined blocks of local eateries and shops (and the Farmers Market, if you happen by on a Sunday), but I don’t mind as its great to see them get the attention they deserve. Thank you, neighborhood small businesses, for the unique character and small joys you bring to my regular routines! 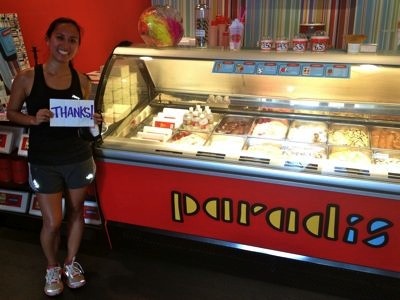 Co-op 28 is perfect for finding that unique gift you’ve been searching for, and when you’re done with your search, Paradis is right next door and ready to provide your tastebuds with some of the freshest ice cream and sorbets they’ll ever have the pleasure of enjoying. (My favorite is the dark chocolate sorbet.) Not in a shopping mood but love live performance served with a side of good food and cocktails? Head a few doors down to Rockwell Table & Stage! I could go on with more recommendations, but for the sake of this entry – you’ll have to just check out my blog or tweets for more of those. 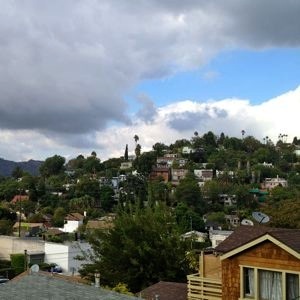 As for me, I continue my jaunt down Vermont until banking a right onto Hollywood Boulevard because no Eastside LA introduction would be complete without at least one peek at the Hollywood Sign and Griffith Observatory. 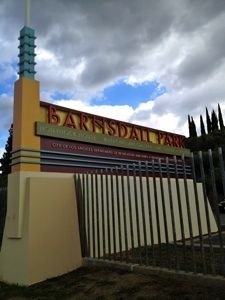 The climb may look intimidating, but it is totally worth the view from the top of Barnsdall Park. Taking in a few moments to admire the view from the top, I felt very grateful for the opportunity to live in a city with such a large variety of scenery. I’m not limited to a concrete jungle of buildings or cookie-cutter developments. I can hop in the car and easily be on the beach or in up in the hills, or (a combination of both worlds) on a canyon summit overlooking the beach. It’s been about a year and a half since I made the decision to move to Los Angeles, going from about 100 to 2,000 miles away from my immediate family. Thank you, Mom and Dad, for all the love and support, whether near or far. 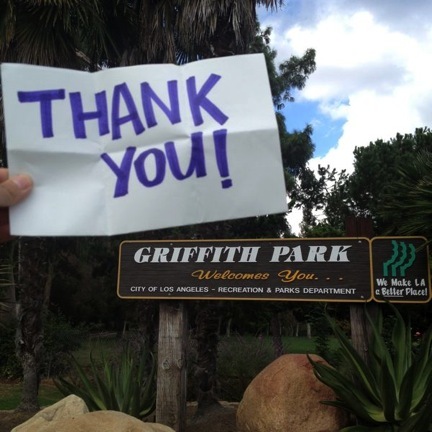 To conclude the run, I turned back onto Griffith Park Boulevard from the polka-dotted plaza which leads you through the Silverlake hills and right back to where we started. Do take care of the combination of the incline and uneven sidewalks as you check out the view and houses. I took a spill with about three-quarters of a mile to go and had to backtrack for some first-aid assistance at a friend’s house. (Thanks, Jaymie! Hope I didn’t make you late to dodgeball.) Blame the sugar and runner’s high, I suppose. Nevermind my natural tendency to trip over my own feet on flat ground. 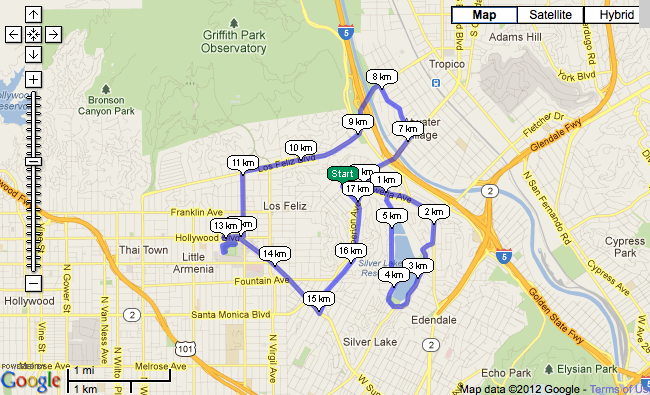 So there you have it, 10.5 miles around Eastside LA. Hope you’ve enjoyed! Tawny Barin is happy to call herself an adopted-Angeleno after spending a little over a quarter-century divided between the West, the East and the South. 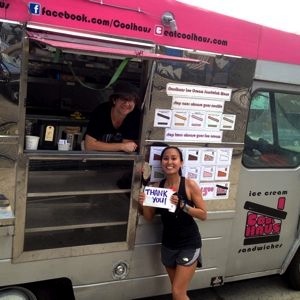 She is still in search for a food-truck and production company to sponsor her world-wide running and culinary adventure. so then you will absolutely take pleasant know-how.